If you are not familiar with eggs in a basket you are missing out. My kids love them for presentation, but I find them irresistible as a one-stop meal. This is a recipe for my grown up version. 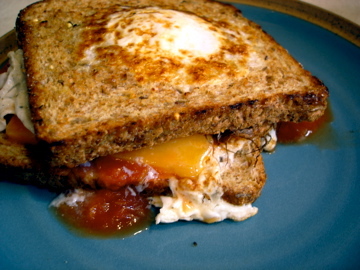 Made with sprouted grain bread, jumbo eggs, Tilamook cheddar, and fiery salsa, these stacks end up hearty, healthy, south of the border, and a wee bit sophisticated. Spray a nonstick pan with oil, and heat on med-high. Using a 2 inch round cookie or biscuit cutter, cut a whole out of the center of each slice of bread. Place both slices of bread in pan. Crack eggs individually, and plop each one in a hole. Sprinkle with salt and pepper. Spray tops of eggs and bread with oil. Fry for about 2 minutes. Flip each slice of bread with a spatula. Cook for another 1-3 minutes depending on how you like your eggs. Remove from heat. Sandwich slice of cheese and salsa in between both "egg in a baskets." Enjoy immediately. *I like to save the rounds cut out of the bread for kid sandwiches. Or, alternatively, spread preserves on them to go with your savory breakfast.